Acts 2:20 the sun shall be turned to darkness and the moon to blood, before the day of the Lord comes, the great and magnificent day. Peter is quoting the prophet Joel 2:31. Peter’s comments take place on the day of Pentecost or Shavuot in the Hebrew. This day was the last of God’s appointed spring holidays. It takes place 50 days after the burial of Christ. The year was 33 AD. …just as you yourselves know…The audience knew exactly what Peter was saying. Jews and gentiles had observed the miracles Jesus had performed. They had seen the solar eclipses. Their most recent solar eclipse was two weeks before the death, burial, and resurrection of Jesus. The people of Jerusalem saw the moon rise in eclipse, blood red, the next day after Jesus was crucified. They had seen the two previous lunar eclipses on Passover and Tabernacles the year before in 32 AD. 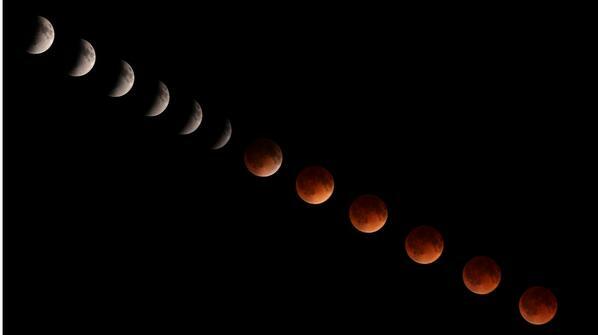 The last blood moon eclipse was to come later in the fall on The Feast of Tabernacles of 33 AD. These events in the sky, along with the miracles performed, confirmed Jesus’ identity as the Messiah. Peter also mentions …And in the last days…the sun shall be turned to darkness and the moon to blood, before the day of the Lord comes, the great and magnificent day. Here we are again. The history of the sky, sun and moon, has repeated itself to the month and day on God’s appointed holidays. 2014-2015 AD was the same as 32-33 AD. How close are we before the day of the Lord comes? This entry was posted on October 11, 2015 at 8:31 AM and is filed under Pentecost/Shavuot/Feast of Weeks, Prophecy, Trend Update with tags 33 AD, Acts 2, Apostle Peter, blood red moons, Jesus Christ, Joel 2, lunar eclipse, Pentecost, September 2015, Shavuot, solar eclipse, tetrad. You can follow any responses to this entry through the RSS 2.0 feed. You can leave a response, or trackback from your own site.